The three retired to the Safe House to talk and get to the bottom of things. "I wish Skratch was here. He could really help with this mystery," said the Wabbit. At that very moment Skratch loped into the dining room. He waved to everyone to keep quiet and gestured. Lapinette pointed to a question mark hanging where the exit sign used to be. Wabsworth gazed at his drink and pretended not to notice. Skratch hissed and waved his paws. He meaowed rapidly about his last film class. He spoke of modernism and defying erotetic models then gave a lengthy discourse on narrative structure. 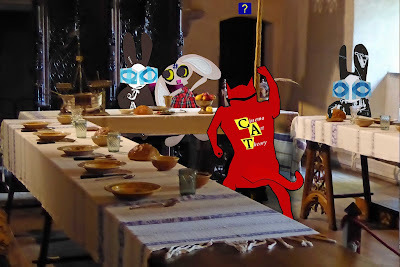 It seemed like gibberish but the Wabbit knew it was code. He nudged Lapinette beneath the table and winked at Wabsworth. "Let's drop the case," he smiled. "We'll never find the answer." Lapinette sensed a movement from behind the door. She picked up her glass and proposed a toast to unsolved cases. Wabsworth quietly left the room via the kitchens. Skratch continued his discourse. Lapinette's ears swivelled. She hopped silently backwards and gripped the door handle. They heard scurrying on the stairs, then a shout and a yell. Blue blood seeped under the door. Lapinette tugged the handle and it flew open. Wabsworth stood on the threshold holding an enormous carrot and grinning at something prone on the ground. He leaned down and whispered. "Busted."